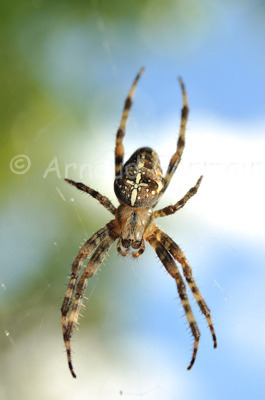 I took this picture of a European Garden Spider (also called Araneus or Epeira) in France, at my parents'. This spiders are common in hedges. To take the shot, I used my 105mm macro lens, looked up towards the spider as the sky was mostly blue and I added a touch of flash to give justice to the spider's colours.